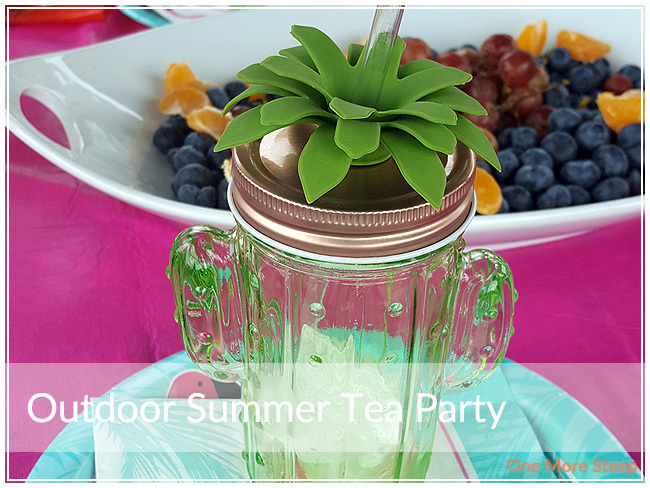 If you follow me on Instagram (@onemoresteep), you might have already heard about or seen photos from my outdoor summer tea party last week! If you missed it, or you’re interested in learning more about what went into the tea party, continue reading! 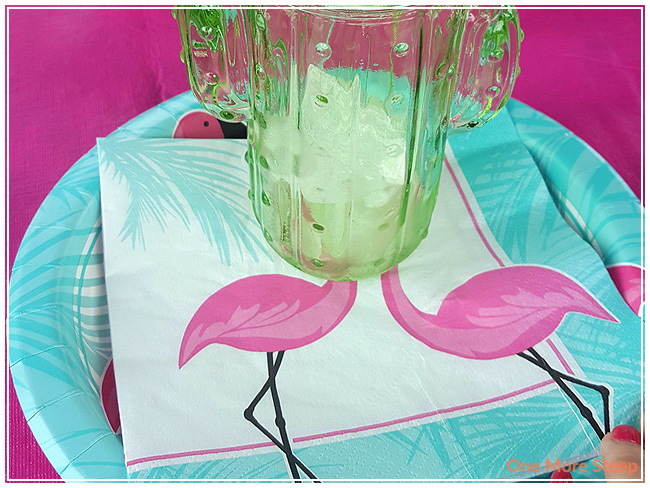 I started planning this back in May when I first stumbled across the teal and pink flamingo paper plates and napkins at a local dollar store – which is really when the whole idea started rolling. I also picked up an extra pitcher (for lemonade), the pink table cloth, and a green serving platter at my local dollar store as well. There were eight people total (and two dogs! ), and it was held at a local park that had covered picnic tables. It was actually a pretty awesome day, weather-wise. There was some overcast in the morning and it led to the entire day being a lot cooler than it had been in previous days. Everyone got a pineapple or a cactus glass drinking cup at their seat – and this was also something that they got to take home as well. This turned out to be a huge hit. I got both the pineapple glasses and the cactus glasses from Stokes. 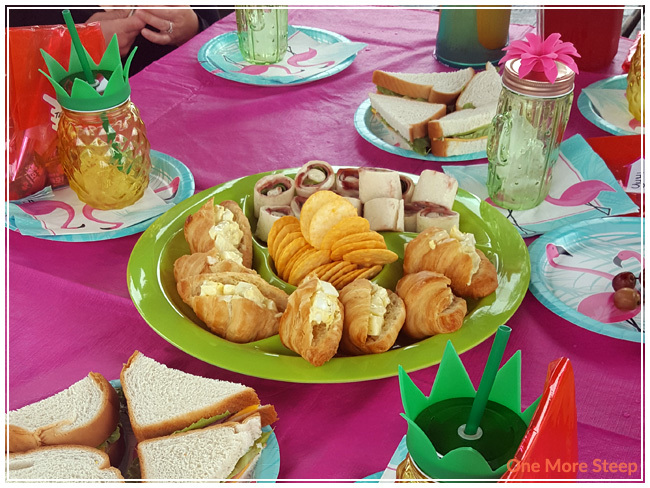 Food items that I brought included: ham, cheese & lettuce sandwiches, turkey & cranberry pinwheels (wraps that are sliced), egg salad croissants (inspired by Little White House), cheese rice crackers. Food items that my guests had brought: fruit salad (so many blueberries! ), cupcakes, chocolate covered cream puffs (! ), and brownies. Of course, there was tea! I cold-steeped two fruit infusions from DavidsTea – Just Peachy and Strawberry Lemonade. I also made a pitcher of ‘regular’ lemonade using organic lemons and agave syrup. Each guest was sent home with a little goodie bag consisting of honey sticks (from the Honeybee Centre), strawberry Pocky, guava candy, and little tins of tea (assorted varieties). The goodie bags for the kiddo attendees also included a sheet of tea-themed stickers. As it was kid-friendly, I kept the food simple and nothing too out-of-the-ordinary, and I think it worked out pretty well. Especially since they weren’t kids I’m often around, I don’t know how adventurous they are with food. 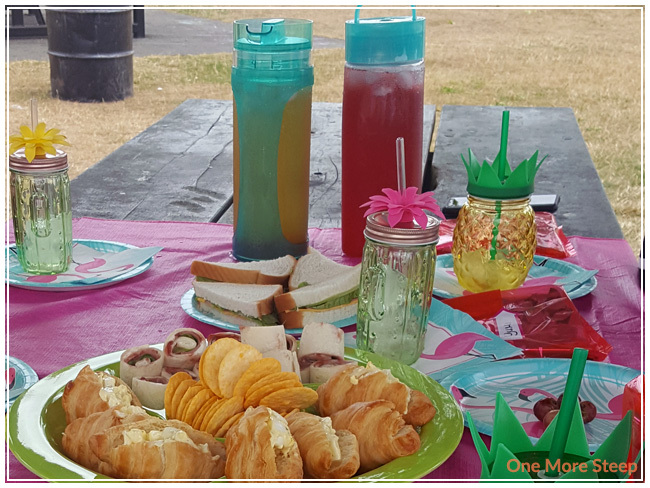 That said, the iced tea choices were hit between kids and adults alike, and pretty much all of the food was gone by the end of it so I would call that a success!